I did it again, I bought more beauty products that I quite frankly didn't need. Seriously, someone needs to stop me! I do have an excuse though (I like to tell myself this so I feel better about my inexcusable spending habits) as Boots lured me in with their 'too good to say no to' buy one get one half price offer. I'm beginning to realise I should avoid that website at all costs. I didn't go to the website with anything in particular in mind but there was a few products I'd heard a lot of good things about and they suddenly popped to the forefront of my mind whilst having a browse around. I decided to pick up another Collection Lasting Perfection concealer as I bought the wrong shade the first time around, the new Seventeen Phwoarr Paint concealer, Max Factor miracle touch creamy blush in the shade 'soft pink' and a Loreal Infallible eyeshadow in the shade 'Sahara Treasure'. I've read lots of good things about these products so I'm excited to give them a whirl. I've tried a few of them and so far so good, apart from the Collection concealer which broke me out. Boo! I then picked up the Maybelline Pure BB Cream after hearing the lovely Tash from Its Simply Beauty raving about how wonderful it is. I saw her applying it in a You Tube video and it looks great on her so I'm looking forward to giving it a proper try. I've used it once or twice and like it on first impressions but I'll use it a few more times before sharing my thoughts. I also bought the Loreal 'Skin Perfection' correcting day moisturiser as it had money off and my auntie recommended it to me. She has fab skin so I took her word for it. I've also been really impressed with their Skin Perfection micellar water so I wanted to try something else from the range. I've used it a few times now and I'm pretty impressed with the texture - it sinks in really nicely and creates a nice base for my makeup. Again, I'll report back with my thoughts after using it for a little while longer. Whilst browsing around the Boots website beauty section I spotted an advert for new Rimmel Apocalips shades and I was instantly intrigued. I don't know about you but I wasn't even aware they'd released new shades as I haven't seen any hype surrounding them on blogs or any talk on Twitter. Maybe I'm just totally behind on the news but either way, I was pretty excited to see a new selection of shades available. I decided I HAD to get my mitts on one of the new shades so I picked 'Across the Universe', a deep red which looked perfect for A/W. I won't say anything else as my next post is going to be a full review of this so you can read more then. Finally I decided to purchase the infamous OPI Nail Envy as its been on my wishlist for as long as I can remember and my nails are currently in appauling condition. I wear acrylics all the time as my natural nails are so damaged but I've decided enough is enough and I want to do everything I can to grow my natural nails and get them in tip top condition. I'm sick of spending a fortune on getting my nails done so I'm excited to see how I get on with this. I didn't buy it from Boots as I wasn't willing to spend £18.50 on a nail polish so I hunted it down on ebay here for the bargain price of £9.25 including free delivery. I know ebay can be dodgy but I checked out the seller and they're top rated and a shop that specialise in nail products. The product arrived super fast and everything seems fine with it so I'd recommend checking them out. I'm going to do a 'before' and 'after' post about my experience with Nail Envy so keep an eye out for that. So that's what I've been buying recently. I know its naughty but who can resist such pretty beauty products? Clearly I can't. Keep an eye out for full reviews of all of these products in the near future if you're interested in hearing more about them. 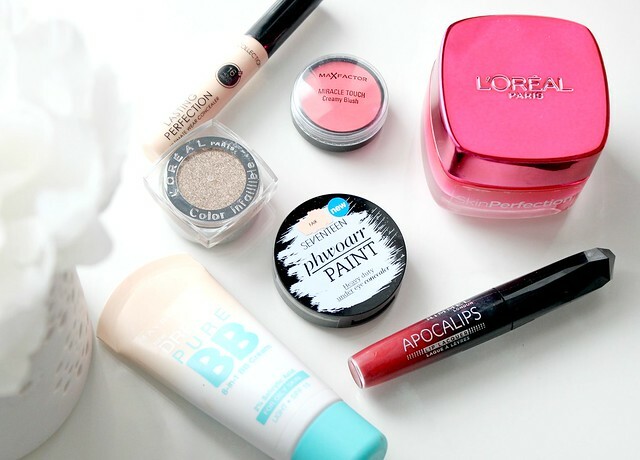 Fab buys, I really want the Loreal cream it looks lovely too! Love a bit of pink! I really want to look into the L'Oreal Paris Skin Perfection range! The OPI nail envy is brilliant if your planning on growing your own nails and getting into perfect condition. The CND Solar Oil Nail & Cuticle Conditioner is really great too! The blush looks like such a gorgeous colour! Really want to try that bb cream! These are some awesome purchases! So jealous. Could you do a full review for the moisturiser? It sounds lovely! Boots makeup offers are just too hard to resist, don't think anyone can walk by without purchasing! So many great products there, can't wait to hear your thought on the L'Oreal moisturiser. Really interested to see how the Nail Envy works. I was going to pick up the pink version of it but wasn't sure if it was worth the money. For some reason I keep spending obscene amounts of money in Boots and Superdrug recently as well! The Maybelline Cream Blushers are my favourite, and Nail Envy fixed my weak flaking nails in no time! I reeaaaally want to try the L'Oreal Moisturiser - it sounds amazing! I stopped getting mani's to improve my nails but I haven't used Nail Envy so I'd love to see what you have to say! And I can't wait for your review on the Apocalips! I've been so obsessed with these Rimmel Apocalips lip lacquers! I think they're amazing. I bought two last year: Big Bang and Celestial :) I don't really dare to wear Big Bang out though... I'm having a hard time applying it because my hand is a little shaky and I find that it stains easily! 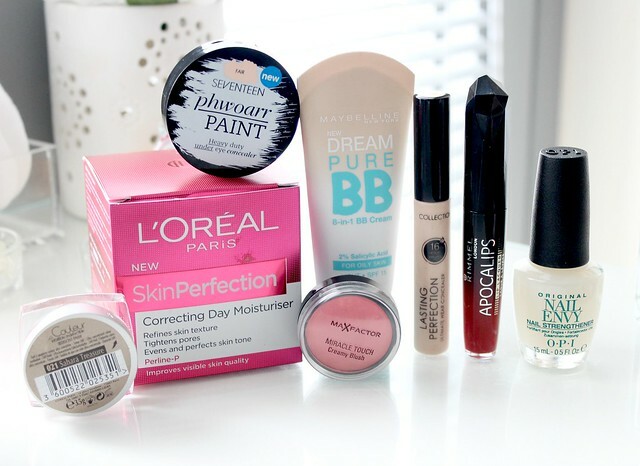 Enviable haul, I really want to try some of the new loreal skin perfection stuff! I will say that they are winning these days though, adore their products! Nail Envy is definitely worth the money. Absolute life saver. It's so easy to just pop into boots/superdrug for one thing and come out with 5+ extra items! Always the way! It's possible you didn;t hear about the new Apocalips shades because they were originally part of the US launch of them? If you don't follow many US-based blogs it's possible to not have known! I am still yet to try Apocalips but I want to! I am writing my thesis about Social Media and how it's used by the Beauty & Sporting Goods ( focus on sporting apparel) Industries. Every genuine participation in my survey means a lot to me. And hereby I really mean A LOT. various beauty goodies or a pair of brand new Nike trainers). Simply copy & paste the link below and answer all questions in order to be entered into the draw. Great picks Kayleigh! I didn't even know there was new shades in the Apocalips range! I want the O.P.I Nail Envy too, but wouldn't fork out the money for it yet. That's a great bargain you got. Hopefully you get on well with it, can't wait to see how it goes! amazing haul as always :) Cant wait to see what you think to Seventeen's phwoarr!!! I just bought it online now after seeing so many people post such good things about it! Would love a review on the Day Moisturiser as I'm on the hunt for a new one - and loved the micellar water too! I had heard a little birdy pipping about the new apocalips colour releases - and that one looks gorgeous and autumnal! i would appreciate it if you checkout my new post in my blog! You have got to know the ways to take care of the ornaments too. As the ornaments, including Crystal Necklace, are light weight in nature, you may not bother taking them out of the different parts of your body. But, after you take out the jewelries, you must wipe off the sweat from the crystals, magnetite and metals, used in the jewelries. This will ensure that the precious stones and metal balls will not lose their luster even after many days of using the ornaments. You have got to keep the ornaments in separate boxes too and the lid of the boxes should be tightly closed, so that the moisture can not affect the ornaments. The Max Factor colour looks so pretty, that will really suit you. Been after the infallible eyeshadows for a while now, they all look so pretty! Really need to try the Loreal eyeshadows, they look beautiful.